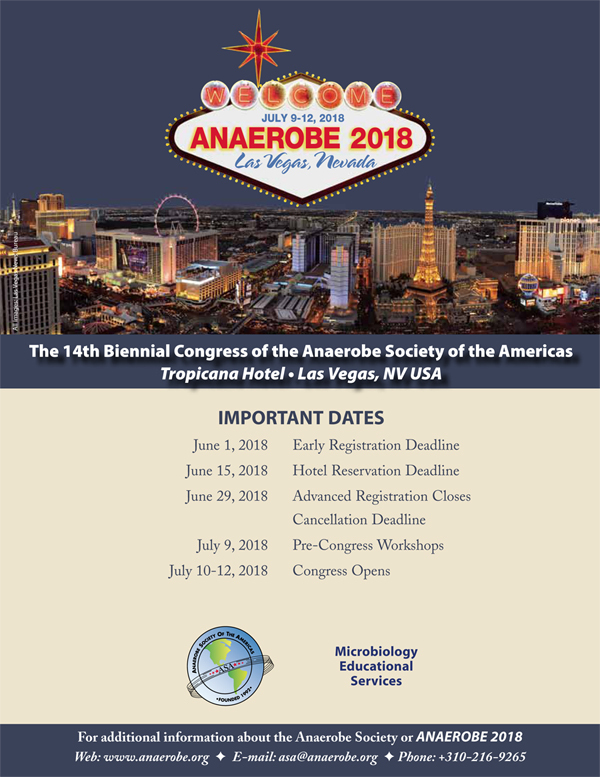 The Anaerobe Society of the Americas (ASA) hosts ANAEROBE 2018--July 9-12, 2018 at the New Tropicana Hotel in Las Vegas, NV USA. ANAEROBE 2018 will address both the clinical and microbiological aspects of anaerobes, as related to human diseases, animal diseases, and environmental conditions. Mixing theory and practical applications, the Congress will consist of invited speakers, oral presentations, and poster presentations, representing work by researchers from over 20 countries. The ANAEROBE 2018 program consists of Pre-Congress Workshops (see below), 18 general sessions with over 60 oral presentations, and 2 poster presentation sessions. There will also be a Young Investigator's Competition (sponsored by the Anaerobe journal), in which finalists will be judged on oral presentations in front of their posters. Registration is available for Members and Non-Members for Full Congress Packages (including banquet), Meeting Only, Students, and Daily Rates. Advanced registration rates are available until June 29, 2018. Below is the link for Oral Session and Poster Presentation Guidelines. Poster Printing: Scientific Poster Printing/Las Vegas is offering poster printing services, with a discount (about 15%) and delivery to hotel. Go to Scientific Poster Printing/Las Vegas and select material, size, turnaround time, drag and drop pdf file, and click on Add to Cart. Then go to View Cart to Checkout, using promo code ANAEROBE. If you have questions, there is a Live Chat form or call: (702) 996-0901. Submit your posters by July 1 to ensure no problems. Posters will be delivered to the Congress Office for pick up. Let us know when you submit, so we can track posters. Demonstrate knowledge of the latest developments in the field of anaerobic research. Apply new recommendations in the diagnosis, screening, treatment, and prevention of clostridial, obstetric and gynecological, periodontal, intestinal, and other anaerobic infections. Incorporate better utilization of the microbiology laboratory into the delivery of patient care. We are offering two full day Pre-Congress Workshops (7.0 CEUs) on Monday, July 9. Early registration for each is $140. Techniques for identifying anaerobes based on phenotypic characteristics will be presented. These methods will include appearance on gram-stain, growth on selective media, susceptibility to special potency antibiotic disks, preformed enzyme reactions, and classical biochemical reactions. Use of MALDI-TOF for identification of anaerobes will be discussed. The Anaerobe Educator software program will be used to present test reactions and to allow for active audience participation in the identification of organisms. Susceptibility testing methods, including agar dilution, broth microdilution, and Etest will be discussed. Participants will identify 15 unknown organisms using techniques presented in the workshop. Workshop 2: Examining Anaerobes in the Microbiome: Metagenomic and Culture Approaches. Instructors: Laura M. Cox, Ph,D. ; Casey Theriot, Ph.D.; Anna Seekatz, Ph.D. The microbiota, composed of trillions of bacteria, fungi, and viruses, colonize all living animals and can influence health and disease. Advances in multi-omics technology have increased our ability to interrogate these important interactions. This course will provide didactical instruction and foundational knowledge on microbiome study design, manipulation via microbiota transplants and antibiotic therapy, sequencing and analysis, and metabolomics. It will also cover approaches for cultivating, isolating, and identifying diverse bacteria within the microbiome. The course will include clinically relevant examples, and aims to increase a student's fluency with microbiome terminology and their familiarity with publicly available resources. This course is appropriate for students, postdocs, faculty, and clinical researchers interested in microbiome research. A limited number of hotel reservations at the Tropicana are still available at rate of $90+tax per night (resort fee included). This rate includes high-speed wireless internet access in guest rooms, 2 bottles of water, fitness center access, and show and drink discounts. Click to email the Anaerobe Society office with desired dates (July 8-13), number of beds, and credit card & expiration date. or call hotel: 800-634-4000, group code SAN18, to check their availability. Las Vegas is the most exciting and entertaining city in the world. Besides its reputatioon as a gambling mecca, this city offers a variety of dining experiences, from the finest restaurants to unique fast-food joints; top-notch live entertainment, from magicians to concerts; and recreational options from soaking in the swimming pools to tours of Red Rock Canyon, Hoover Dam, Lake Mead, and the Grand Canyon. Where else can you ride up the Effel Tower, walk the canels of Venice, and the enter the Luxor pyramid, as well as view a pirate ship battle, an exploding volcano, and dancing fountains -- all in the same day. See below for show discount pricing. The Tropicana Hotel Concierges are happy to suggest and arrange other alternative activities. They can be reached at: (702) 739-3626. Monday, July 9 -- Pre-Congress Social Activity. 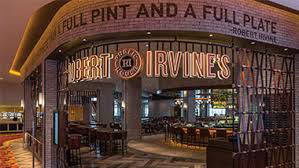 To kickoff the Congress, network with Congress attendees Monday evening at Brews, Wine & Wings in the bar at the Tropicana Hotel's Robert Irvine Public House. You can purchase a $22 ticket on the Registration Form for 1 drink (beer & wine) and a mini-order of Chicken Wings) or just show up and buy your own drink. Tuesday, July 10 -- Congress Reception. The opening day of sessions concludes with a Wine & Cheese Reception for delegates to socialize and network. Wednesday, July 11 -- Congress Banquet. Held in the Havana Room at the Tropicana Hotel, this evening will include a reception and a plated dinner (see registration form for entree options). Over dessert, Congress awards will be presented, including The Finegold Award for Best Abstract, the Young Investigator's Awards, and the Lifetime Achievement Award. This year's recipient is Dr. Ellen Jo Baron of Stanford University and Cepheid, Tickets MUST be purchased in advanced (see registration form). On-site tickets will not be sold. 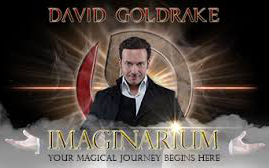 Imaginarium Show discounts: At the Tropicana Hotel, award-winning illusionist David Goldrake presents a 75-minute extravaganza that takes the audience on a journey through a surreal place that lies somewhere between the world we call our own and a breathtaking world full of dreams and fantasies. The Tropicana is offering Preferred Section seating for $35 (including fees) -- a savings of $70. An excellent Post Congress event for Thursday night. Click for Information and Tickets For our discount, click on Buy Tickets, select the Performance Date, and enter the Offer Code "CONV" at the top of the page. 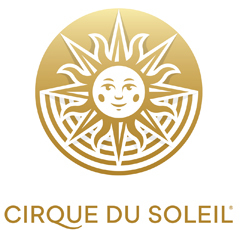 Cirque Du Soleil discounts: Cirque Du Soleil are the most popular shows in Las Vegas. Though tickets are pricey, they are an experience of music, dance, and gymnastics. We have arranged discount pricing for "Michael Jackson One," "Ka," "Beatles Love," "Mystere," "O," "Chris Angel Mindfreak," and "Zumanity." Click for show previews and ticket availability/pricing. Discounts also are available for Blue Man Group. Air Travel: Las Vegas McCarren International Airport (LAS) is the eighth-busiest airport in North America, with over 30 airlines providing nonstop service from over 100 cities. Direct international service is provided from Brazil, Canada, China, Denmark, Germany, Mexico, Norway, Panama, South Korea, Sweden, Switzerland, and United Kingdom. Airport Transit: Bell Trans offers shuttle service from the airport to the Tropicana Hotel, beginning at $8 each way (prices do not include gratuity). Taxi service from the airport to Tropicana is approximately $15 each way. ANAEROBE 2018 has been planned and implemented in accordance with the Essentials Areas and Policies of the Accreditation Council for Continuing Medical Education (ACCME). Physician Accreditation: No Physician Continuing Medical Education units will be issued for this Congress. Attendees may request Certificates of Attendance, free of charge, for pick up at the conclusion of the Congress. Laboratory Scientist/Technologists: Microbiology Educational Services will provide continuing education contact hours upon completion of the program. ANAEROBE 2018 offers sponsorship and exhibit opportunities to industry. Space is still available. For information, Click for Exhibitor Registration or contact the ASA office.